Feel free to be inspired and share your answers in the comments or link to your blog post with the same tag. Stand-alones. I hate with a passion trilogies where each book ends with a humongous cliffhanger to make you want to buy the next book. It is like the author is trying to strong arm you into buying 2 additional books. Female authors. I read a lot of romance and I have not seen many male romance authors. Amazon. Since I love my Kindle (just got a paperwhite YAY), I buy most of my books from Amazon already. 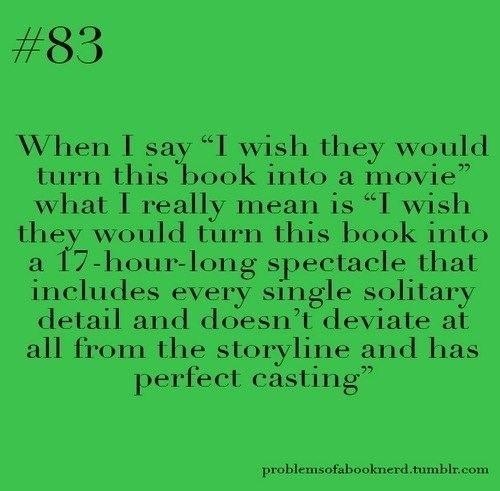 I would like to say neither because I do not think either do the book justice. But if I have to choose – Movies. The TV shows are more likely go off script when there are more seasons than books. I am a purist with this sort of thing. 5 books per week! Reading 5 pages per day seems like water torture. Professional reviewer. That would be how I am now, but I would be able to support myself financially too. That’s like a dream come true. Librarian. I love libraries. Funny story: Growing up, I was complaining that I did not have enough money to buy more books. My mom told me that she knew of a place where I could read all the books I wanted for free. “Where is this magical place?” I asked excitedly. What kind of question is this? My favorite genre, OF COURSE! All day, every day. Only a masochist would choose otherwise. This is difficult but I guess I would have to choose ebooks. I have close to 1,000 ebooks in my Kindle library now. 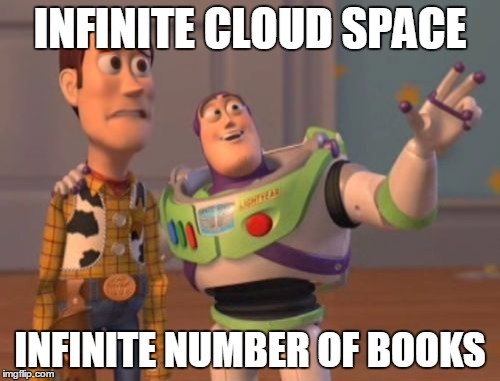 With unlimited storage in the cloud…Let’s just say that makes me very happy to think of all my books. To infinity and beyond. Sorry to be coming in so late but…I just wanted to say that sometimes authors don’t necessarily *want* to write series books (can’t comment on the cliffhanger-y element though) but are *forced* to. My books are all complete stand-alones, no connection at all other than location, but Amazon has told my publisher that they want SERIES books, dammit! So, speaking for myself, my books are packaged as a ‘series’ (titled The Yorkshire Series), purely because of Amazon’s demands. I think, if authors are being pushed to write series, then they may put cliffhangers in because – well, what’s to lose? I like stand alone books that are n series where the main characters of one book are supporting characters in another book. Did not know that about Amazon though.